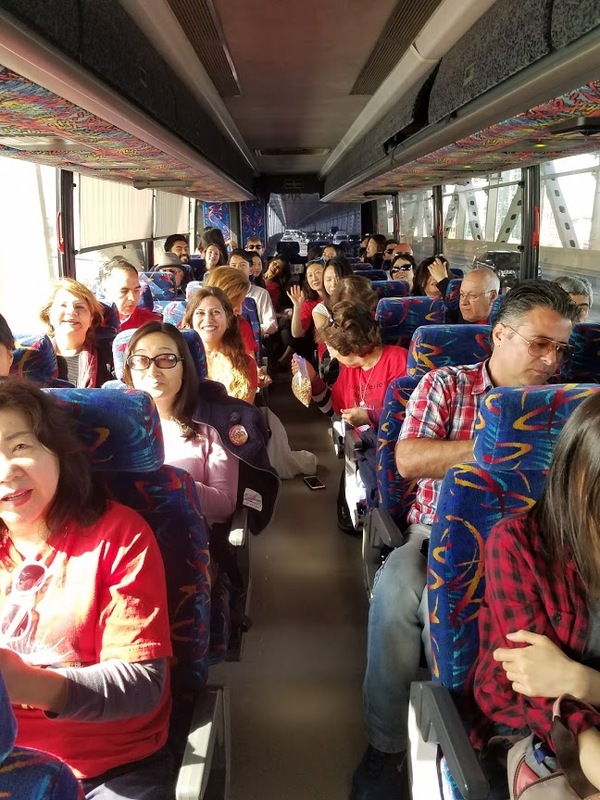 On April 9th, fifty students and two teachers from San Mateo Adult School took a bus to the state capitol of Sacramento to join a rally for Adult Education. The rally was held by CCAE - the California Council for Adult Education. 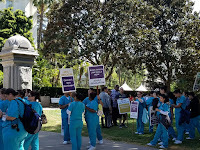 Students and staff from all over California attended the rally. They rallied to bring attention to the need for strong funding for Adult Education. They rallied to remind legislators that Adult Education matters. Rie Shinohara was one of the students who attended the rally. Here, with her permission, is her story about that day. 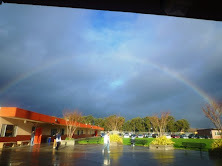 When I first arrived at San Mateo Adult School, there were many new students in the lobby waiting to be registered. I could easily get in a class after I paid $30 fee for the semester. Later, the cost of going to this school became free, and one day, I heard that modern office technology classes became free, too. I thought that some people must have played an important role to waive fees from students; however, I did not think through how they did it. I assume that once students are in the school system, they take it for granted that their seats are secured and no further action is needed. As I have worked as a volunteer to assist new student registration process for the last two years, I noticed how many people need more education to live in the United States. Last few semesters, classes got full quite quickly, and several of the scheduled registration dates were cancelled. There were waiting lists, and I knew some students who were dying to get into particular classes. I felt a growing need for adult education, and there was a chance to express my thoughts. 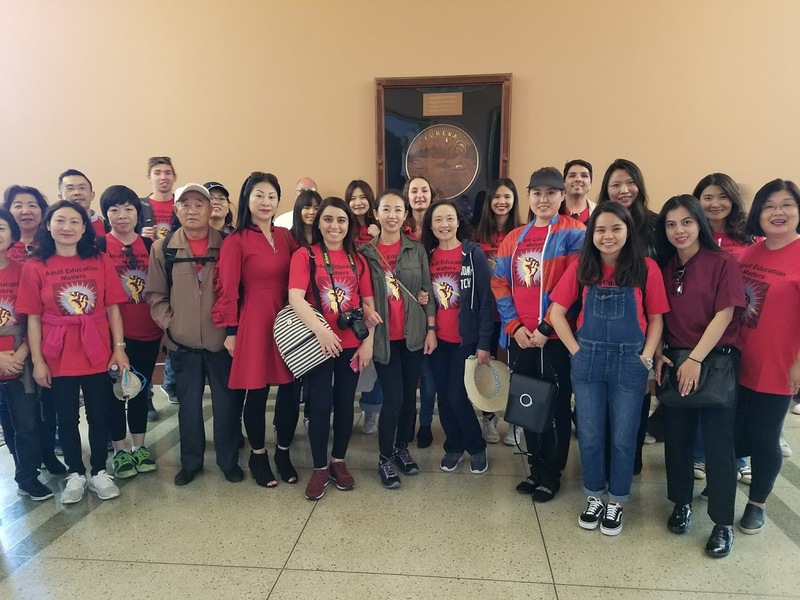 On April 9, I was at the capitol of the state, Sacramento. 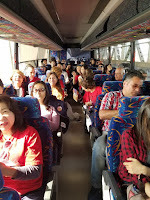 More than 50 students and some faculty members from San Mateo Adult School headed for a rally for adult education that was organized by the California Council for Adult Education (CCAE). 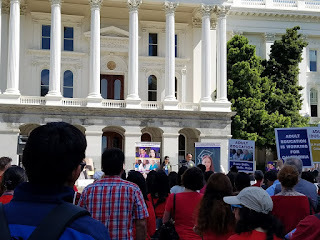 Before the rally began, we were trying to witness the moment when assembly members declared that the week was Adult Education Week. Third floor was literally full of people who wanted to appeal their own needs, and I could not even see how the room legislators were in looked like. I later heard that the declaration was not made on that day because the legislators had too many items on their agenda. Right outside the capitol building, with abundant sunshine coming down to us, the rally started. 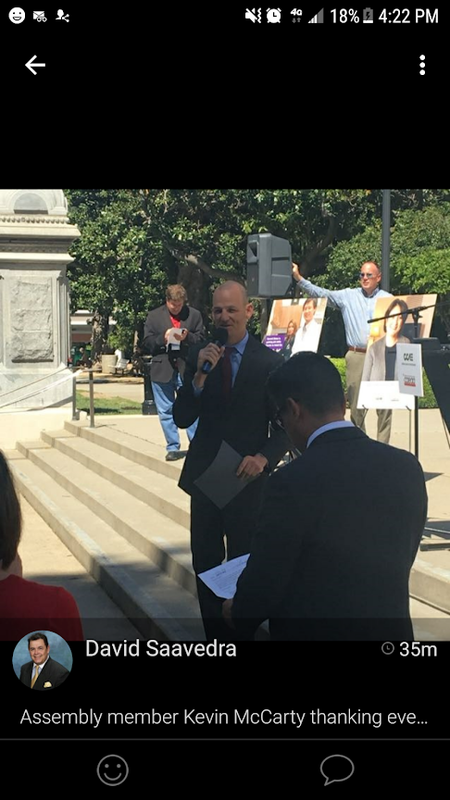 Groups of people from all parts of the state gathered to support adult education, and I was surprised by the number of people at the event. Many people held signs that said we need adult education. Some people were in scrubs, indicating that they pursue medical profession through adult schools. 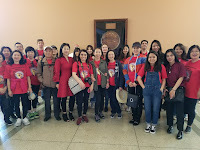 The group of us from San Mateo wore red clothes, like we do every Tuesday at the school to show adult education matters. 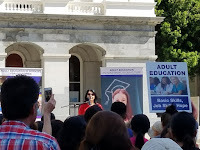 Our presence at the rally clearly showed that there is a need for adult education. It was so sunny that Kevin McCarty, an Assembly Member, asked if it was okay for him to come into a shade with those gathered. He actually benefited from the adult education system because he was short on credits to graduate from his high school. It was somewhat encouraging to me that someone who now works as a legislator took some courses at an adult school. From the beginning of the event, I was standing by a woman who anxiously held a palm-sized handwritten script in a small red folder. I instantly sensed that she was going to present her speech. In fact, the woman, Margarita Lewis, from Castro Valley Adult and Career Education, was the last person to share her story after two men who also spoke about their appreciation for adult education. When her name was called, she left my side, hastily asking her friend to take a video of her speech with her phone. Having witnessed her nervousness, I felt closer to her than any other speakers who came to the podium. She spoke about her situation, her family, and citizenship class at the school, where she prepared for the citizenship test and also made friends. After her speech, participants enthusiastically clapped, and her friends at the school came to her and gave compliments and hugs. 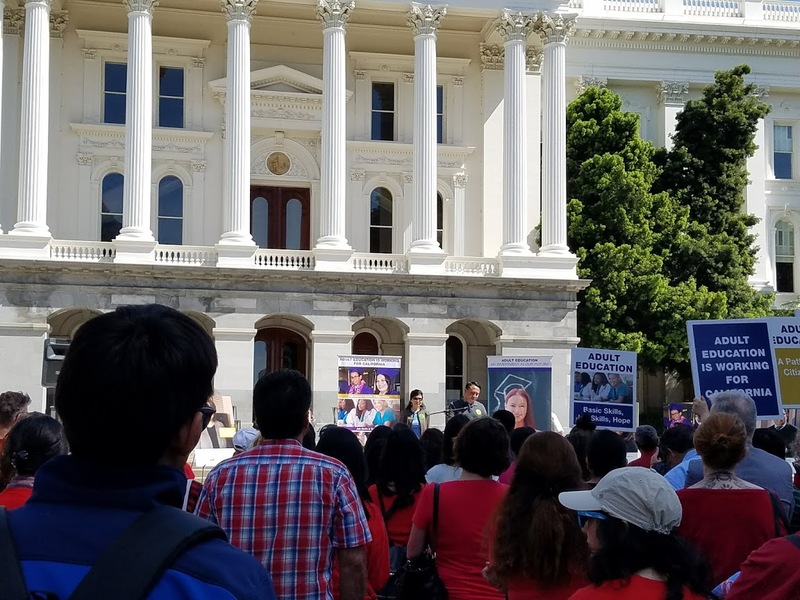 The rally reassured those gathered that the state of California needs places for people to study for their next stage. Many people need English to live in their communities, while some others need high school equivalent degrees or practical career trainings. Adult schools can serve people with so many different goals. For example, the first speaker Joshua Lang studies at Inland Career Center after serving way over 10 years in a correctional facility. The second speaker Erick Salas wants to work at a court after finishing his court reporting course at Sacramento City Adult School. If it were not for those schools, people would be having difficulties going from one to another phase of their lives. 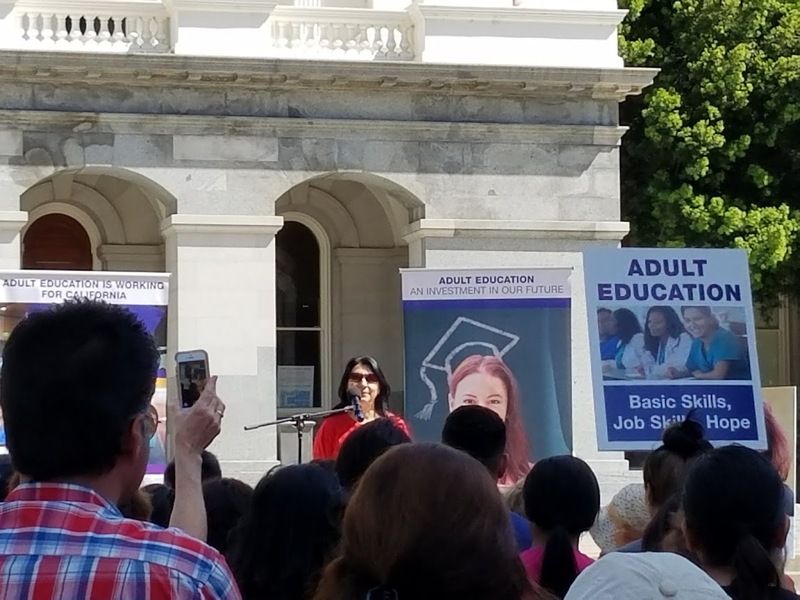 Having been a part of the rally, I feel that I deeply understand the need for adult education. That was my first time to see students from other adult schools and hear their stories. 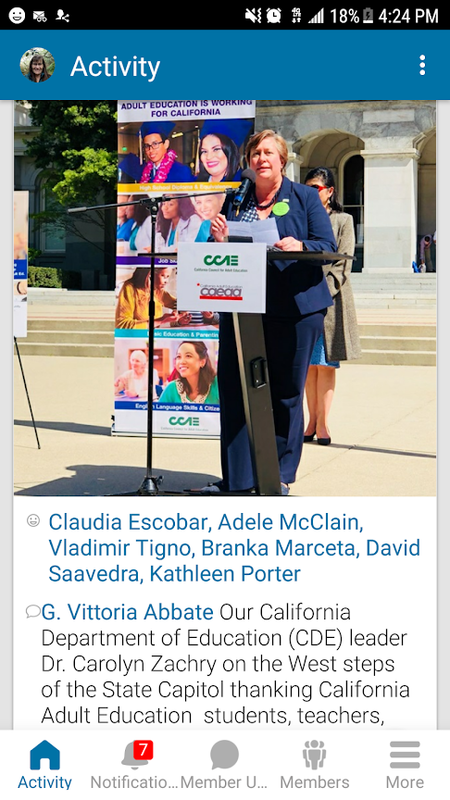 Also, I had never seen people who are in charge of adult education, such as Carolyn Zachry, the head of adult education for the California Department of Education, and Kevin McCarty. It is crucial to talk with those who have power to make difference in adult education so that schools have more budget to serve a wide range of students’ needs. I would like to encourage other people to come to the rally next year to experience the feeling of being the part of the effort firsthand.